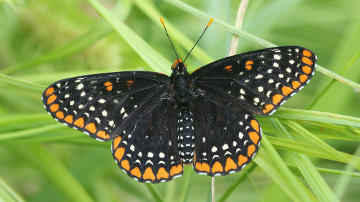 The Baltimore checkerspot can look all-black when it flies, but its orange and white markings are visible when it lands and spreads its wings. Along with summer heat, July brings the height of butterfly season and the possibility of glimpsing favorite familiar butterflies, as well as others you might not have noticed before. 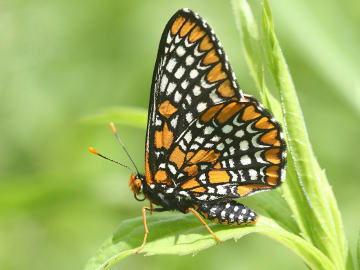 The Baltimore checkerspot (Euphydryas phaeton) could easily become a favorite once you see it. This medium-sized butterfly (2-inch wingspread) can look all-black as it flies, but when it lands you can see its orange and white markings. Its memorable checkerboard pattern is easy to see when it holds its wings upright. Like the bird we know as the Baltimore oriole, this butterfly is named for the orange and black colors of Lord Baltimore, the British colonizer who founded Maryland in the 1600s. The butterfly is often called the Baltimore for short. The Baltimore’s striking checkerboard pattern shows when it perches with wings upright. Why the bright colors? Like so many creatures in nature that sport oranges and reds that make them obvious in a green and brown world, the Baltimore wears “warning colors” that act as a stop sign to keep predators away. And why would a bird or other predator want to avoid this butterfly? Its body contains chemicals (called iridoid glycosides) that make it unpleasant to eat. 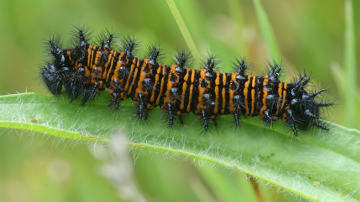 The butterfly gets these chemicals in its caterpillar stage, when the caterpillar eats certain plants that contain them. Not surprisingly, the Baltimore caterpillar, too, is protected by warning coloration. It is red-orange and black, and prickly-looking. Female Baltimores lay tiny eggs by the hundreds, either on white turtlehead (in wet meadows) or narrow-leaf plantain (in dry meadows). What plants do the Baltimore caterpillars eat to get their protective chemicals? They currently have two main host plants, and both contain the same chemicals. Female Baltimores lay their tiny eggs by the hundreds in clusters (see photo) on either of these plants. The original host plant is white turtlehead (Chelone glabra), a wildflower of moist meadows and stream edges. Deer like to eat it and may be making it scarce. Fortunately, beginning in the 1980s, Baltimores did a surprising thing. 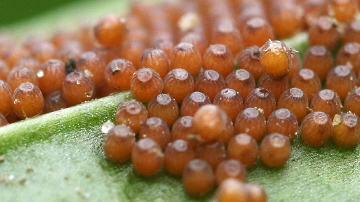 They began using another, more common plant, narrow-leaf plantain (Plantago lanceolata) for their eggs and caterpillars. This weed arrived in North America with European settlers and grows in relatively dry meadows. By adapting to this new host plant, Baltimores found new food and protection for their caterpillars and also began using a new portion of the environment, namely dry meadows. Like the adult butterfly, the Baltimore caterpillar sports red-orange “warning colors” that tell predators to keep away. Watch for Baltimores in places where these plants might be found – in wet meadows (white turtlehead) and dry meadows (narrow-leaf plantain). Baltimores have been spotted in St. Luke’s fields in Westborough, where there is plantain and where unused fields are managed for nesting birds and other wildlife. Baltimores do best in fields that are mowed only once a year, in the fall. Baltimores fly slowly. Males tend to perch on low plants to wait for females. Females tend to fly around searching for plantain or turtlehead where they can lay eggs. 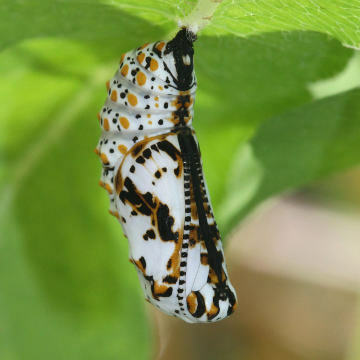 Inside a mostly white chrysalis that probably looks like a bird dropping to predators, the caterpillar transforms into a butterfly. Once laid, the eggs hatch into caterpillars after about two weeks. The caterpillars feed together on the host plant and eventually hibernate. After surviving the winter, the caterpillars feed on a variety of plants in the spring and grow until they are large enough to form chrysalises. These casings probably look like bird droppings to other creatures – a good disguise. Inside their chrysalises, the caterpillars safely transform into the next year’s Baltimore checkerspot butterflies, which emerge in June and July. While you’re outside this summer, you might also notice some brown moths flying around in the daytime, possibly in significant numbers. They’re fast, zigging and zagging and bouncing through the air, especially in the woods and near trees along sidewalks. What are they? Unfortunately, they’re notorious pests – gypsy moths (Lymantria dispar). The brown males are flying around looking for females, which are white and don’t fly. Females simply wait on tree trunks and lay eggs there. Look around and you’ll probably find that the leaves on nearby trees – especially oaks – have been eaten, sometimes leaving the trees denuded. (In most cases, the trees will grow a new set of leaves but will be weakened.) The destructive gypsy moth infestation has now arrived in our area.